Sorry moms and dads, but PLS has jumped aboard the poop emoji ship with all the kids (and there’s going to be lots of poop talk in this post)! There’s just something about that stinky little guy that grabs kids’ interest every time, and we have ways of using that to our benefit. I spotted this “Pass the Poop” game today and I just had to buy it for the kids at PLS. Read on to find out why a musical poop stuffy made its way into our program budget. When we work with kids, we follow their motivation; we adjust our teaching depending on what our learner is currently interested in. We get creative, and make the child’s special interest or silly request part of our teaching. When we are using toys, games, treats, program materials, books, or anything else that our learner is highly motivated by, it’s more likely that they will attend to those materials and be more engaged in the learning opportunities. 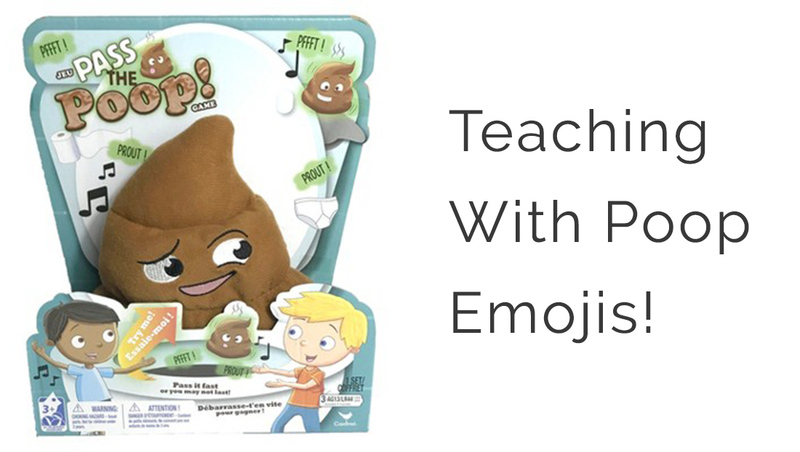 In other words, if the kids want poop emojis, we ought to teach with poop emojis! Make no mistake, we are still able to toss around a poop shaped pillow, have a lot of laughs, and work on vital skills while hitting all of the ABA program’s targets. If you read some of your child’s ABA program goals, you might find that hard to believe. But at PLS, we are kids at heart, and we know how to make even the driest program objective come to life. “Billy will attend to peers” becomes Billy eagerly looking at and waiting for a peer to toss the poop pillow his way. “Billy will follow three-step directions” becomes Billy having the poop act out three different actions, or taking the poop to three different areas of the clinic. “Sarah will complete a three-component pattern” becomes Sarah tossing the poop to peers in patterns, or putting pattern stickers on the poop. “Sarah will mand (request) to peers” becomes Sarah inviting a couple of friends to join her in a game of toss the poop. Believe it or not, we can use musical poop to also teach sharing, turn-taking, requesting, labeling, prepositions, following a schedule….and so much more. If a child is motivated by the musical poop, then we will work with that motivation to promote learning. If you’ve ever heard or thought that ABA is robotic, boring, stressful, rigid, then you haven’t heard of ABA at PLS. When your child’s behavior technician is a fun-loving kid at heart, with training in natural environment teaching and the freedom to be creative with their program materials, the ABA program comes to life, and your child enjoys learning. Contact us if you’d like to tour our clinic to learn more about our services and our philosophies!